Extravasation is when a chemotherapy medication or other drug leaks outside the vein onto or into the skin, causing a reaction. 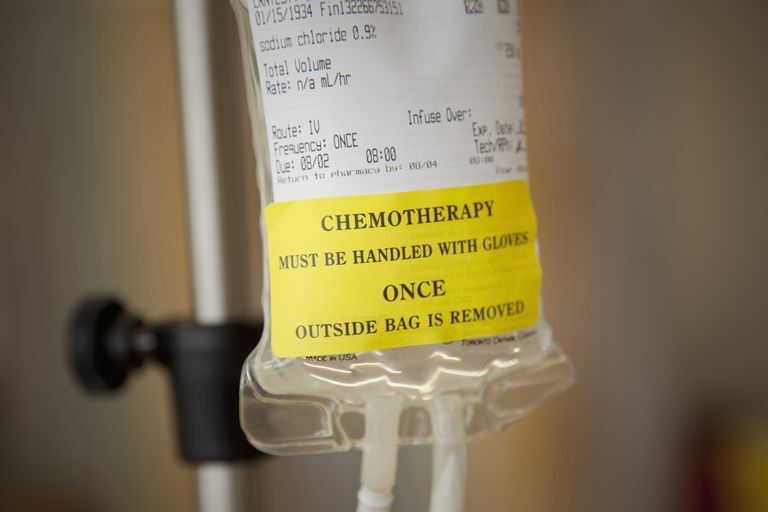 In chemotherapy, drugs are classified into two broad categories based on the effect they have on tissues when they extravasate—irritants and vesicants. Irritant medications are those that cause temporary, superficial damage to tissue when they leak. If there is an extravasation of an irritant medication, you will notice some redness, swelling, itchiness and possible discomfort at the site of your intravenous (IV) catheter. If one of these medications does leak, your health care provider will stop the drug, start a new IV and give the remainder of the medication through a fresh site. Treatment for extravasation of irritant medication focuses on making the site feel as comfortable as possible. Your health care provider may recommend mild pain medication, such as Tylenol, and cool compresses as needed. Some examples of irritants commonly given in the treatment of leukemia and lymphoma include cytarabine, bleomycin, etoposide, and dacarbazine. Vesicants are drugs that have the potential to cause serious damage to tissue if they leak outside the vein. In this case, you will also notice redness and swelling, but it is likely that the discomfort at the IV site will be more noticeable. Some of the signs of extravasation may not be visible until several hours after it occurred. Depending on the amount of drug that extravasated, there may be blistering, peeling and darkening of the skin over the site. It is possible for it to take a few days before the full extent of tissue damage is visible. The seriousness of vesicant extravasation depends on the specific drug, the amount that leaked out, the concentration of the drug and the actions taken immediately following extravasation. Your nurse or doctor will stop the drug and try to aspirate as much of the medication they can. They will apply either warm or cold compresses (depending on the medication) and may need to apply or inject an antidote to help minimize tissue damage. If there is redness, your health care team will often outline the area with a marker so they can tell if it is getting better or worse. As with an irritant medication extravasation, your health care provider will need to give the remainder of the chemotherapy through a fresh IV site. You may need to see a surgeon if there is deep tissue damage. Examples of vesicant drugs include vincristine, vinblastine, vinorelbine, idarubicin, doxorubicin, and daunorubicin. Although the nurses and doctors who are giving you chemo are trained in administering these drugs, accidents can happen. If your chemo is at especially high risk of extravasation damage, your physician may choose to insert a central venous catheter (CVC). Extravasations from CVCs, while they are still a possibility, are exceedingly rare. Treat your intravenous site or CVC with care. Avoid touching the IV site or tubing during your infusion. Let your nurse or doctor know immediately if you begin to have symptoms of burning, stinging or itching around your IV site during infusion. If you notice any redness or swelling after leave the cancer center, call your doctor immediately. Chemotherapy extravasations are very unusual. The drug's classification as a vesicant or irritant will help determine the amount of damage it can cause. While every step is taken to prevent extravasation, it can still happen. Your responsibility as a patient is to let your nurse or doctor know if you notice any changes in your intravenous site during or after chemo infusion. J. A. Pérez Fidalgo, MD, et. al. "Management of chemotherapy extravasation: ESMO–EONS Clinical Practice Guidelines." Annals of Oncology Volume 23, Issue suppl 7, Pp. vii167-vii173.